The project looks at monuments, (by) architects, (for) governments, and ideals' tensional relationship to ideologies in times of shifting states. Exhibited at the 56th Venice Biennale 2015. Plan for Greater Baghdad was activated by a set of 35mm slides taken by architect Rifat Chadirji in 1982 of a Gymnasium in Baghdad that was designed by Le Corbusier and named after Saddam Hussein. The project looks at monuments, (by) architects, (for) governments, and ideals' tensional relationship to ideologies in times of shifting states. The Saddam Hussein gymnasium metamorphosed through numerous iterations of plans over twenty-five years before it was inaugurated in 1980. Up until then, the commission for the Gymnasium passed through five military coups; six heads of state; four master plans, each with its own town planner; a Development Board that became a Ministry and then a State Commission; a modern starchitect among a constellation of many others with their associated architects, draftsmen, contractors, agents and lawyers; local architects accompanied by similar structures from their own consulting firms, from government departments, and from parallel commissions; more than one local artist/sculptor; eager competitors; and other monuments that simultaneously appeared and disappeared as a result of these same conglomerations. Politicians, architects and artists welcomed Le Corbusier (1887–1965) among other modern architects in 1957, when he came to Baghdad to visit the proposed site for the Sports Complex commissioned to him by Iraq’s Development Board. Chadirji (1926– ) has reflected critically on the work that he and his colleagues presented in the exhibition organized in the same year upon Frank Llyod Wright's (1867–1959) visit; he expressed feeling relief however at seeing Wright frown upon recognizing traces of Le Corbusier’s influence in his designs. Baghdadis and Le Corbusier aspired for the Sport Center to be "one splendid focus point of the town" and to "have a great attractive power." They also hoped that it would "be of an extraordinary utility," incorporating the latest technologies. But what they wanted the most was a structure that would give shape to a modern Mesopotamia in which in its "Lieu of Architecture" would run waters channelled from the Tigris, and lie an artificial wave pool collected from its flow. The same architects but with new set of ministers will work with the newly established Iraqi Republic announced in the wake of the July Revolution in 1958 lead by Brigadier Abdel Karim Kassem (1958–1963). Kassem, too, will continue to regulate the oil revenues shares which had offered Iraq enormous income increases in the late era of the Kingdom. Calouste Gulbenkian Foundation's offer to sponsor the building of a stadium is brought back to study: "There is no doubt that Le Corbusier is an exceptional architect, [but] there is no certainty that he is an expert in the building of stadia. […] We would then be able to supplant Mr. Le Corbusier". Here, Le Corbusier answers to the Ministry of Public Works and Housing question on creating a second stadium in Baghdad: "In principle it appears to me to be quite useless as it minimizes the one or the other by a sterile competition between them." Gulbenkian’s "Al-Shaab Stadium" will be inaugurated in 1966, while Le Corbusier's posthumous gymnasium will not be inaugurated until 1980, which will give it its name after Iraq's new president, Saddam Hussein. Stories in published accounts speak of the distress felt by Chadirji and artist Jawad Salim over demands made by Kassem to include depictions of himself in the July Revolution monument. Salim (1920–1961) realized the monument’s bronze sculptures but didn’t live to install them, and up until the inauguration day, the installed parts of his mural were covered with gypsum so as to prevent artist Khaled Rahhal from reporting them to Kassem. Rahhal’s own statue of Kassem was either dragged through Baghdad’s streets following the military coup in 1963, or cut in half and stored in the National Museum’s backyard, only to be rediscovered in the aftermath of 2003. The same year, and in the same square where Chadirji had once installed his Kassem-commissioned, Saddam-demolished, and Rahhal-replaced Monument to the Unknown Soldier, a statue of Saddam Hussein himself was pulled down in a staged event that marked the Fall of Baghdad. Chadirji was heavily involved in the gymnasium project and in communicating with Le Corbusier and later with his contractors following Le Corbusier’s passing, but he will, however, be absent in the two years of the gymnasium construction (1978–1980), for he will be serving time on his sentence to life in prison. Saddam’s accession to power in 1979 and his personal interest in preparing Baghdad for hosting a non-aligned conference will see Chadirji released from prison to become a top manager in Baghdad’s Municipality. Heavily based on archives, found material, and the stories of its protagonists; Plan for Greater Baghdad looks into protecting the monuments for posterity, and into performing plans for Baghdad as an expression of power or as a necessity. Missing from the representations and citations contained in established archives, the images that document the performances of design, power, and designing power are pieced together from fragments of other images and from records of gestures retrieved from representations and narratives by local artists. Salim feeling vulnerable is just like one of the hidden pieces in his mural; so is the young Saddam Hussein who is on the edges of the scene as (de)constructor. Chadirji jogging in the courtyard of Abu Ghraib Prison or hurrying to photograph the monument of the Unknown Soldier before it is demolished. Kassem announcing a future canal that would link the Tigris to the Euphrates, though he had seen it in the form of a blue line sketched on Baghdad's master plan. His successor, Abdel Salam Aref, emerging from the dust clouds formed upon his helicopter's descent in a village is folding the sleeve on one arm that is gesturing for the crowds to stop the cheering, while he is signaling to Chadirji "Let's Plan!" Between 1980 and the present, the gymnasium functions will involve more than just sports; in 1990 it hosted a concert where crowds dance cheerfully to the patriotic songs of Adel Ogla. Against an image of Saddam on the wall in the background, a man wearing Mickey costume climbs the stairs to the officials’ podium, to respectfully shake the hand of a ministry representative. The US army will station part of it troops in the gymnasium for few years following the fall of Baghdad, while it shall also host some of Iraq’s 2014 parliamentary elections campaigns. The gymnasium sparked set of conferences on Baghdad’s architectural modern heritage will be held at University of Baghdad, the building of which was designed by Walter Gropius (1883–1969) in the same commissions era. Produced as a set of motions and signals enacted by characters frozen in the denouements of historical time, two- and three-dimensional depictions pertaining to the men who appear in the Plan for Greater Baghdad, along with the interventions into existing documents culled from various archives, produce a multi-layered time map that pits developments in the gymnasium story against those in Baghdad. Two- and three-dimensional prints, archival material and model. 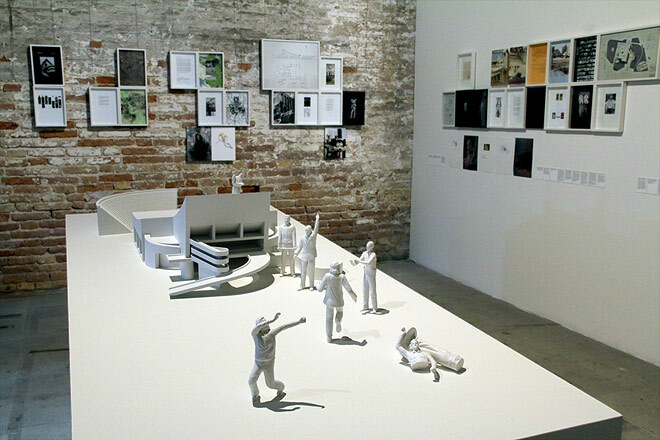 Kuwait’s first National Pavilion at the Venice Biennale 2013, with works by Sami Mohammad, Tarek Al-Ghoussein. Curatorial reflections.